Universal Health Services' CFO said Thursday the hospital chain was "almost spot on" in terms of its own projections for its acute-care revenue in the first quarter of 2018, despite missing analysts' expectations. The King of Prussia, Pa.-based hospital chain released its first-quarter results after the market closed Wednesday, and its stock fell more than 7% Thursday morning. UHS' net revenue increased 2.9% during the first quarter to $2.7 billion, up from $2.6 billion during the same period in 2017. Analysts with Zacks Investment Research predicted UHS' overall revenue would grow 5% year-over-year. 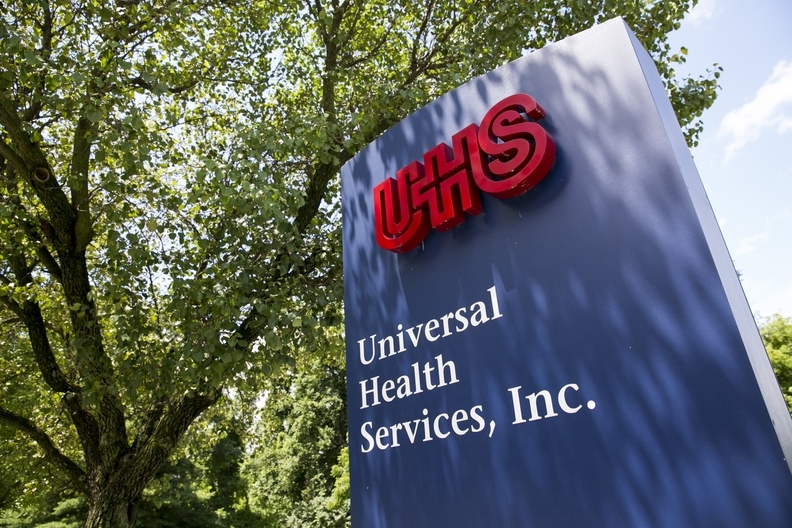 UHS generated $224 million in net income in the first quarter of 2018, up 8.7% from $206 million during the same period in 2017. Revenue from UHS' acute-care hospitals increased 3.7% during the quarter, falling below some analysts' expectations. On the behavioral health side, revenue increased 3%, also below expectations. UHS Chief Financial Officer Steve Filton said on an earnings call Thursday that the chain's same-facility behavioral health revenue growth fell short of UHS' own expectations, which he attributed to a several million dollar shortfall in outpatient revenue because of bad weather in markets like Boston, Philadelphia and Washington, D.C. The for-profit chain's earnings before interest, taxes, depreciation and amortization were $442 million during the first quarter of 2018, down 3.9% from $460 million during the same time in 2017. UHS added $13 million in the first quarter to a reserve it established in connection with the U.S. Justice Department's civil investigation into its behavioral health facilities, bringing the total reserve to $35 million, a total that could still change as the investigation proceeds. The Justice Department's civil division has been investigating more than two dozen UHS facilities since 2016 over false claims allegations. Filton said that investigation, now in its fifth year, has not uncovered "significant, pervasive problems" within UHS' behavioral health division, although he said the chain has not yet entered settlement negotiations. "I think like every organization, if you're going to take that hard of a look at yourself internally, you're always going to find small things that you're going to tweak, and we've done that," he said. The Justice Department's criminal fraud section has also been investigating UHS facilities in recent years to determine whether the company fraudulently billed Medicare and Medicaid for behavioral health treatments. Adjusted admissions at UHS' acute-care hospitals increased 2.3% during the first quarter of 2018, and adjusted patient days increased 5.4%. On the behavioral health side, adjusted admissions increased 1.6% on a same-facility basis, and adjusted patient days increased 0.4%. Net cash from operating activities dropped about 25% in the quarter to $364 million, down from $483 million at the same time in 2017. UHS attributed the change to a number of factors, including a $67 million drop in accounts receivable.